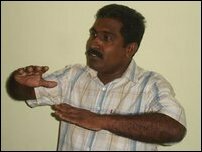 TamilNet: 10.12.06 MP accuses Colombo for "coward's war"
"Nobody can hide the fact by remaining silent. This is a coward's war on civilian populaition." The MP called on the authorities to immediately allow the transportation of injured civilians from Vaharai to Valaichenai and Batticaloa, in the wake of mounting civilian casualties and a Tamil refugee woman, refused transportation, reportedly succumbed to her wounds at Vaharai hospital Sunday morning. "While the Government provides Sinhalese civilians of Sinhapura, Mahindapura, Somapura and Kallaru transport along the land route to the safe locations, it hesitates to even allow the critically wounded Tamil civilians in need of urgent medical treatment from Vaharai to Valaichenai or Baticaloa," the MP slammed Colombo. The MP, in his strongest condemnation of the indiscriminate offensive into Vaharai, which is densely packed with refugees, charged Colombo for it's "singleminded military agenda." The artillery barrage, aerial bombardment and fire from gunboats, has severely threatened the existence of civilians in Vaharai, he told TamilNet. "You don't serve peace, if you fail to condemn the Sri Lankan government in strongest possible terms for engaging in aggression on civilian population," Jeyanandamoorthy added.